There is an ever increasing number of contractors in New Jersey. With the improving economy, more people can now afford the projects they had been putting off. One of those projects that many homeowners had put on the backburner is removing invasive bamboo trees from their property. Nowadays, consumers are looking for options for removing these scourges. 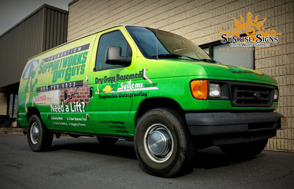 Smart entrepreneurs are using contractor van wraps New Jersey will remember. Are you a contractor in South Jersey? If so, you may find it hard to reach your local market. When consumers are in need of contractors, most find them via an Internet search. They narrow down the search results by inserting industry specialties: Electricians South Jersey, Basement waterproofing South Jersey, etc. So, what are the chances your business will stand out all alone? Zero, because the Internet is now the place where people search for the products and services they need. Potential clients will be given results for many contractors offering the same services you do. So how do you reach locals in the cities and towns you serve? By investing in the one ad tool that is extremely effective—full vehicle wraps.